Fedora 27 is the second release of 2017 of the developers’ favorite operating system. 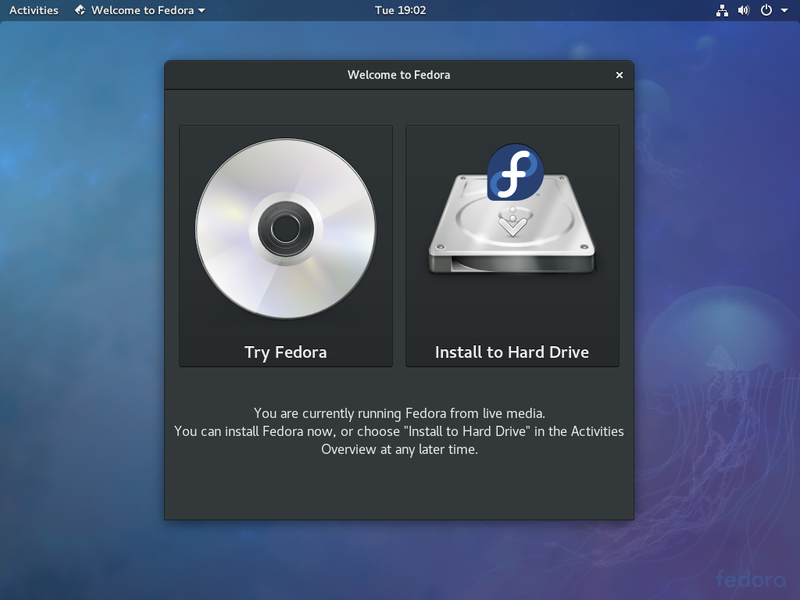 Packing cutting-edge features and pushing forward the whole Linux ecosystem here comes Fedora 27 and how to install it! In Fedora 27 during the whole installation process (step 3 to 8) there will be a “Help!” button in the top-right corner. If you ever need some help. The first thing you have to do to proceed with the installation of Fedora 27 is boot it from a support (CD/DVD and USB Pendrives are today the best options), if you don’t know how to burn the image onto the support find a tutorial on the Internet or use this tutorial. Once you have your support, reboot your machine, select an option like “boot options” or “boot priority list” and select your support, in this way you should see this screen. 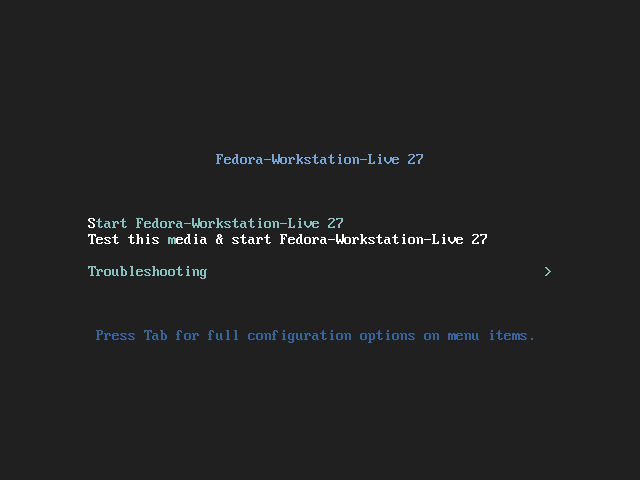 Select “Start Fedora-Workstation-Live 27” to start the installation. Once done, you will be facing the login screen, click on "Live System User" to get to the next step. Now you’re in the live media, your computer is still untouched. From here you can choose to try Fedora 27 (try it a bit to see if everything works fine; usually audio, video, peripherals and network are the things to look at) or to install it right away. When you’re ready to install move on to the next step. In this step you just need to select your preferred language and keyboard layout during the installation. Selecting your language here will affect only the installation, and you can always change system’s language after the installation. This is the hub of the installation that will guide you through the basic configuration. Also, until you click “Begin Installation” there won’t be changes happening on your computer. So be relaxed and don’t panic. I will review each step of the hub excluding “keyboard” which should have been set on the second step. By clicking on Date & Time, this will be the screen you’ll be facing. Just select your time zone and set your current time. If you have selected (and I suggest you to) Network Time, time and date will be retrieved from the Internet. If you have no Internet connectivity, disable it by switching off the switch on the top-right corner. In this step you will set the machine’s hostname (much like Windows). This is the most crucial step in the whole installation, pay great attention to what you do, since messing here may mean data loss. In this step you need to select the devices where you want to install Fedora 25 on (yes you can specify multiple devices, but if you’re not experienced, just check one). 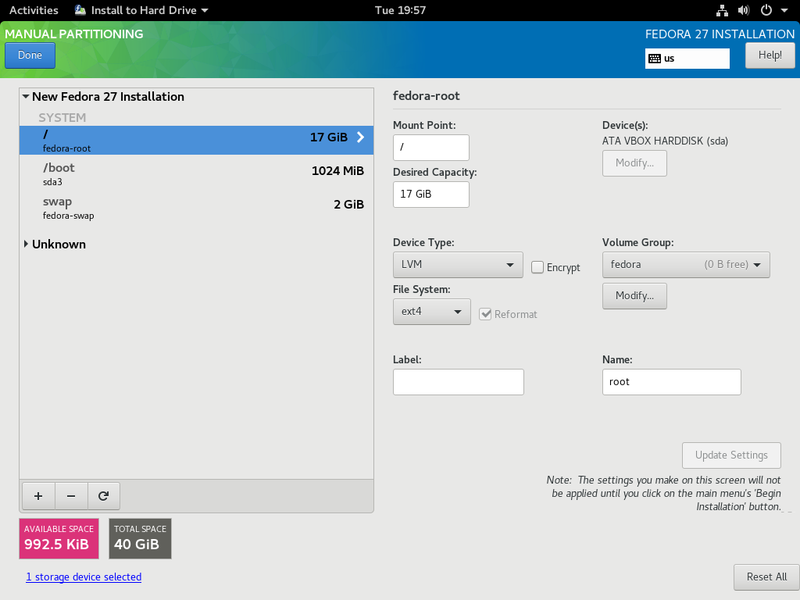 Now you can face two different scenarios: an empty drive or one or more OS installed. If you have an empty drive, just be sure to select “Automatically configure partitioning” and you’re ready to go. If you haven’t an empty drive or want to do things manually follow one of the next two steps. In the case you have an empty drive the screen will be like the one above. If you have enough knowledge you can partition your disk according to your own needs. But if you haven’t I suggest you click on “Click here to create them automatically” (it will have the same effects of “Automatically configure partitioning” in the precedent step. In case you have an empty drive you will see a similar screen if you proceeded correctly. In this scenario you have one or more OS installed on your disk. In my screenshot I had a Windows 10 installation, but it is not (yet) properly recognized and is shown as “Unknown”. If you want to delete one or more Operating Systems just highlight them and click the minus “-” on the bottom of the left box. After that just click Click here to create them automatically or create partitions manually to complete the step and click done. If you decided to install Fedora 27 alongside another Operating System just click on Click here to create them automatically. In the case you have one or more OS installed, you'll be facing a similar screen if you proceeded correctly. You can clearly see the new installation (top) and the preserved pre-existing OS (bottom) called "unknown". At this point you will have everything configured, beware, now is your last chance to recognize mistakes, and if you click “Begin Installation” the installation will proceed and start modifying your disks. So be sure to double check everything if you have doubts, or ask the help of someone experienced. In this step you just configure your user, if you want to be an administrator be sure to check “Make this user administrator” (in this way you can skip the following step). I also suggest you to use a password. Try to use a strong password if you can, including letters, numbers and special characters. Choosing a strong password is important! If you use a weak password you’ll have to click “Done” twice. As you can see this step is much simpler, it just requires a password, be sure to pick something not-too-easy. Fedora 27 isn’t an exciting release, the new features are a bit undertone. What’s most awaited is the so-called Modular Server, codename Boltron. Unfortunately Boltron isn’t yet ready and is only available as prerelease. Most of the changes introduced in Fedora 27 are little fixes and the usual plethora of updates with the biggest one being GNOME 3.26. Overall Fedora is gaining the name of being an usable, stable and up-to-date distribution among first-time users.